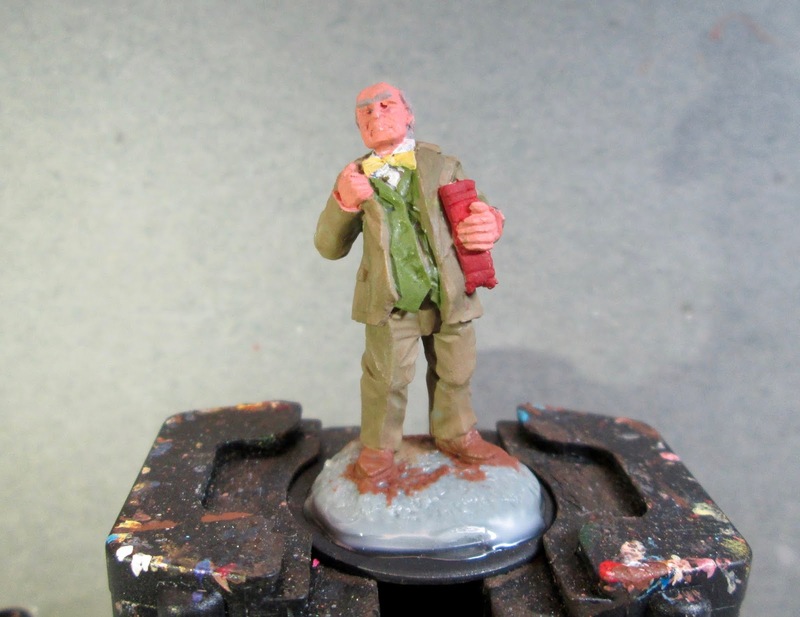 Pulp Era Professor: Bones 3 Figure | H.A.W.K.S. 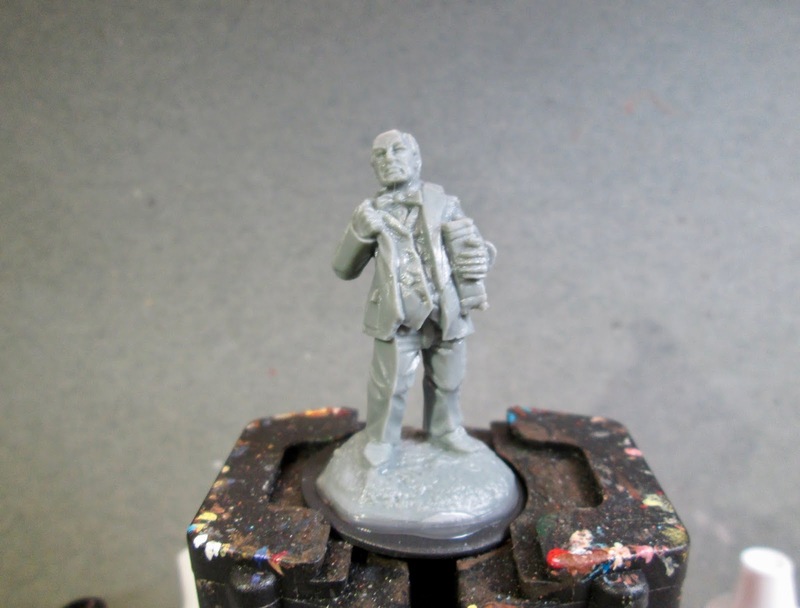 This past week I continued working on the group of Pulp Chronoscope figures I got in a trade, and did the Pulp Era Professor, from the Bones 3 “Mythos Expansion: Part 3”. I decided I wanted to paint him in a tween suit, so went to Google and found one I liked. 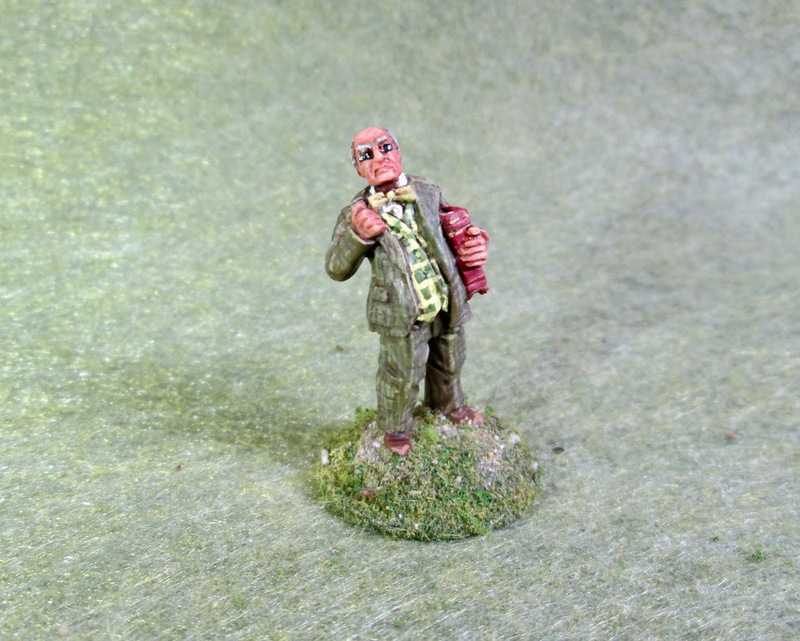 I wasn’t sure how to paint tweed though, so I headed over to the Reaper forum to ask some advice: Tweed? Armed with this information, I thought I might be able to pull off something good enough for the game table. However, I didn’t want my professor to be quite as sharply dressed as the man in the example photo, so I decided to make a few adjustments to the outfit, to make him look more “absent-minded”. I began by painting his face and hands with Americana “Shading Flesh”. 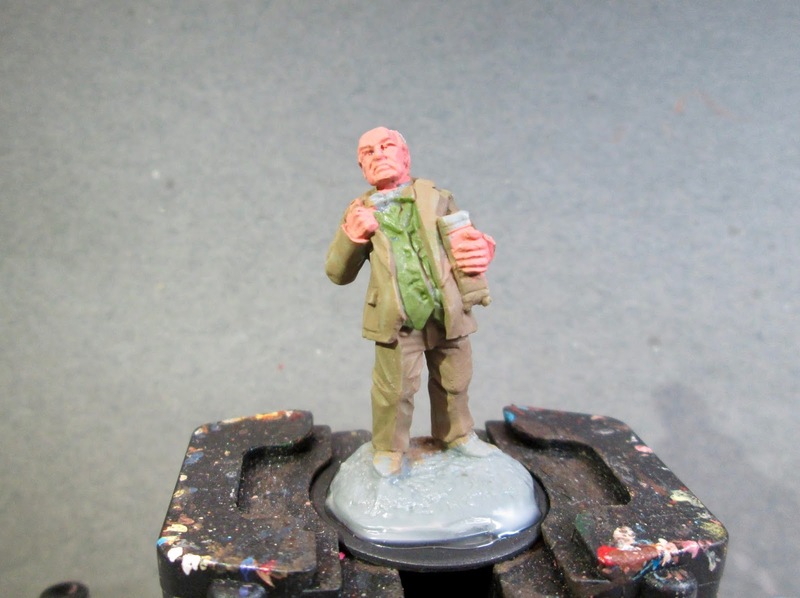 I then painted his suit with a mix of Ceramcoat “Territorial Beige” and Vallejo Model Color “Brown Violet” . After that, I painted his vest withAmericana “Avocado”. Next, I painted his shirt with Americana “Dove Grey”, and his bowtie with Accent “Golden Harvest”. I then painted the cover of his book with Apple Barrel “Apple Maroon”, and the book’s pages with Americana “Antique White”. After that, I painted his shoes with Crafter’s Acrylic Cinnamon Brown", and his hair with Americana “Neutral Grey”. When everything was dry, I gave his face and hands a wash with Citadel “Reikland Fleshshade” wash. When that was dry, I gave the rest of his body a wash with Citadel “Agrax Earthshade”, and his hair a wash with Citadel “Nuln Oil ”. 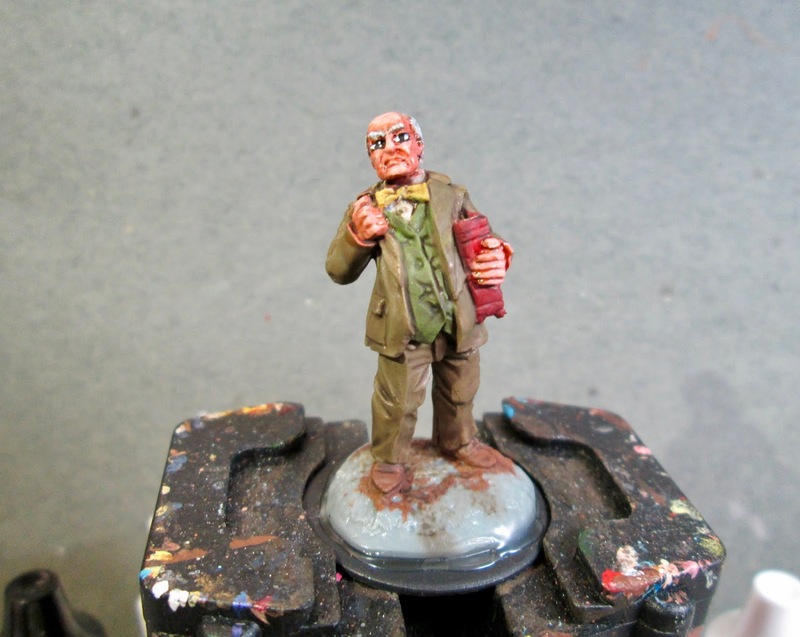 I then painted his eyes, and highlighted his face and hands with the base “Shading Flesh”, mixed some Crafter’s Acrylic “Flesh”. After that, I highlighted his hair with Americana “Grey Sky”. I then highlighted his shirt with Americana “Snow White”, and highlighted his tie with Crafter’s Acrylic “Daffodil Yellow”. After that, I highlighted his vest with Americana Jade Green" mixed with a little of the “Avocado” and dded highlights to his shoes with Americana “Sable Brown”. I then went back and did a check pattern on the vest with the “Daffodil Yellow. I now attempted my tweed effect. 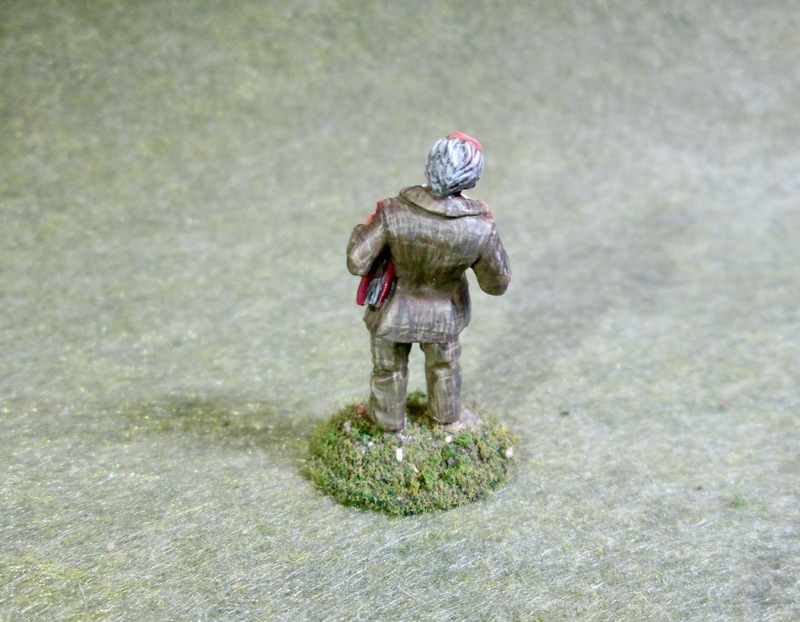 Using Aleene’s "Dusty Khaki”, heavily thinned, I attempted a fine, light, crosshatch pattern on the jacket and pants. I tried to do it a bit heavier on the highlights, and I didn’t do any in the shadows. I wasn’t happy with the results at all. The crosshatching was much too heavy, and contrasty, and looked more like someone had scribbled on his jacket than a texture. 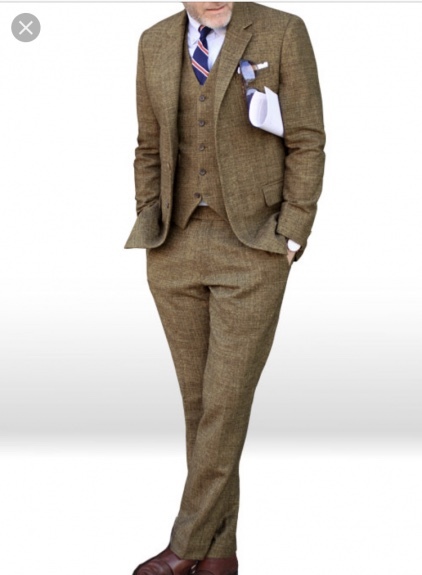 I also wanted to see if I could add the random black spots you see on tweed. So, first I mixed some of Ceramcoat “Black” with a little of the “Dusty Khaki” to “grey” it just a little, and then heavily thinned it, and add some short random lines here and there across the whole suit. When dry, I took some of the original “Brown Violet” and heavily thinned that, then applied it as a glaze over the whole suit to help tone down the cross hatching. I ended up applying a couple layers before I was happy; but in the end got it to a place I was happy with. Lastly, I highlighted the book under his arm with some Folk Art “Burgundy”, and applied some decoration and a title to it with Ceramcoat “Wedding Gold”. I then painted the figure’s integral base with Americana “Bittersweet Chocolate”. Well, I’m rather happy with how the tweed came out for a first attempt. 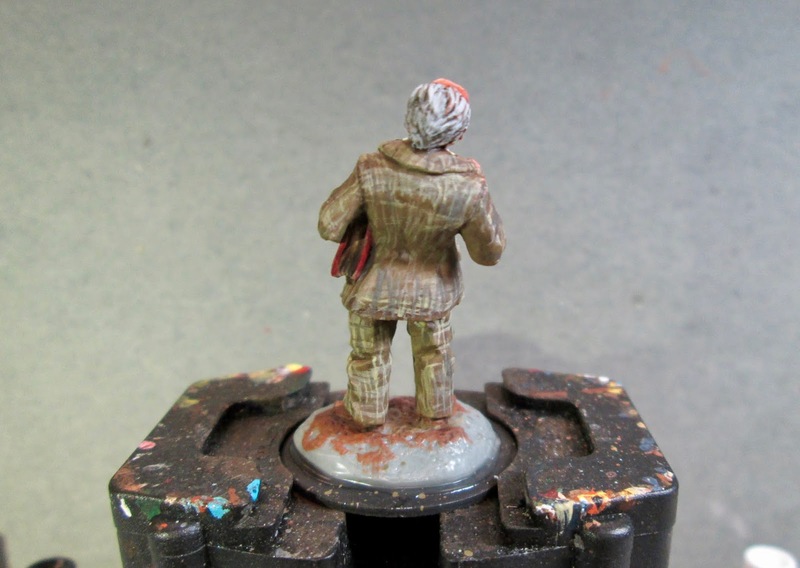 And I think the rest of the painting is good enough for the tabletop, so in general I’m please with the figure. 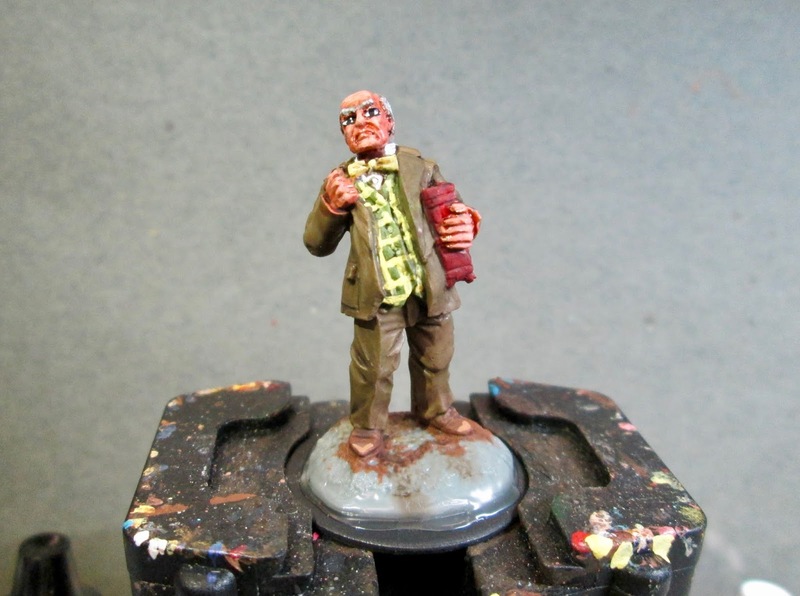 Like the rest of the Pulp figures I’ve painting in the last few weeks, this one too has a very odd pose; leaning back the way he is. I think you saved the tweed effectively – kudos for your bravery at the attempt Chris! Came out nicely! Yep, very nicely done! Like painting tartan, but much more subtle! He really looks the part!